Bringing your music collection into perfect order has never been easier. Watch as TagTuner completes media file information, renames and plays your music. 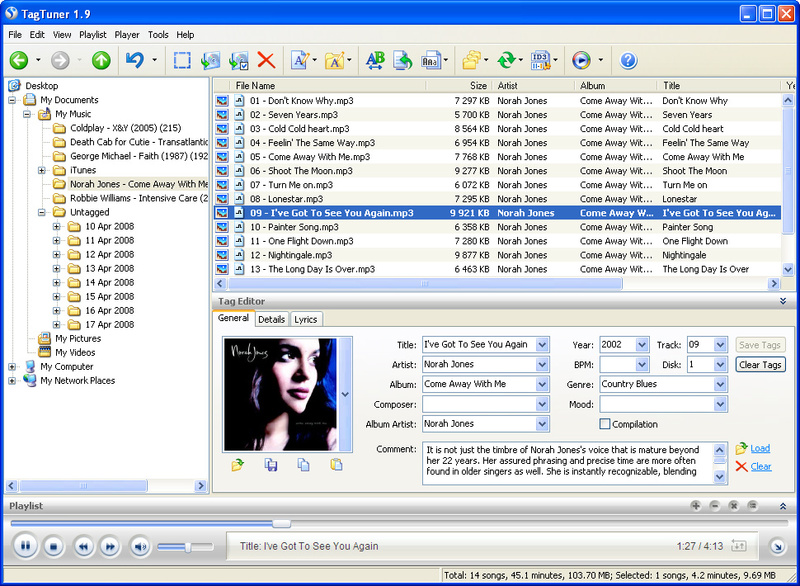 TagTuner offers you the best ways to complete your music file tags, whether you want to get the information from the Internet or add it manually. The “Getting Album Info from the Internet” feature lets you find not only tags like Artist, Song Name, Album Title, but also the original CD cover and at the same time rename the files in your favorite style. This is simple, because TagTuner remembers your settings. For example, you set your most preferred file naming format just once and the next time it will be applied automatically. You can also edit tags manually, one by one, while listening to your music, or using the built-in tag editor to edit several songs at once. Afterwards, you can even rename files in one keystroke. The built-in player enables you to handle your music collection and create playlists without moving your attention to other applications. Set global shortcut keys for your most favorite playlists and switch among them with speed and ease as your mood changes.